LeBron James at the grand opening of the I Promise School in Akron, Ohio. LeBron James attended a Cleveland campaign rally for Hillary Clinton in 2016 even though she was likely to lose his home state of Ohio. After Donald Trump’s election, James repeatedly blasted the president. When Laura Ingraham said James should “shut up and dribble,” he rebutted the Fox News host by saying he had never heard of her before her remark. And now this: On Monday, James wouldn’t rule out running for president in 2020. James began to get involved in political issues during the Obama years — publicly backing the first African-American president and the Black Lives Matter movement, for example — but he’s been ramping it up lately. We often think of athletes as doing something risky when they interject themselves into politics. But I don’t think James really has to worry about any backlash. The wall between the worlds of sports and politics has increasingly broken down, and James’s place in those worlds gives him extra protection. 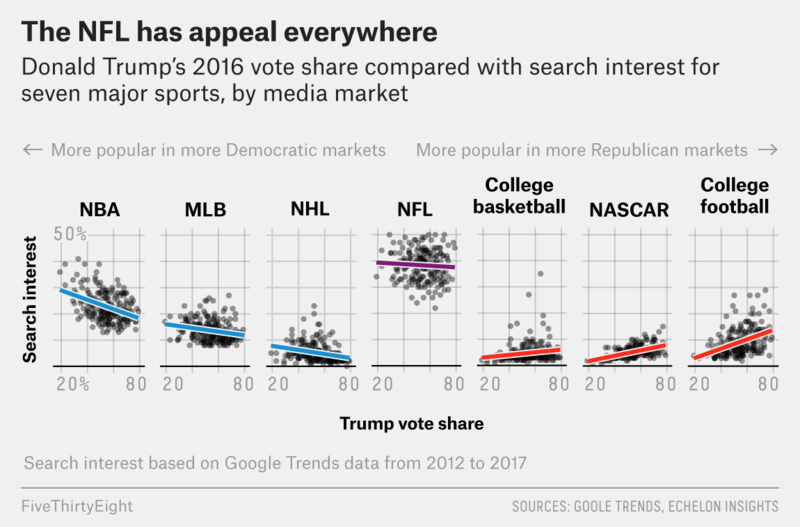 A FiveThirtyEight analysis of Google searches last year found that the NBA is significantly more popular in liberal-leaning areas than in conservative ones. Among the four major pro leagues plus college basketball, NASCAR and college football, the NBA has the most liberal fan base. The NFL, by contrast, is about equally popular in liberal and conservative areas. The NFL has to worry about alienating conservative and/or Trump-supporting fans; the NBA really doesn’t. Looking at James specifically, he played for the Cleveland Cavaliers last season, and Clinton won Cuyahoga County (where Cleveland is located) by about 35 percentage points. Next season, he’s joining the Los Angeles Lakers — Clinton won Los Angeles County by about 49 points. If James played for, say, the Phoenix Suns (an area that Trump carried), his liberal-leaning stances might cause more of a backlash with local fans. I’ve seen comparisons between James and Muhammad Ali. Each was perhaps the leading black athlete of his time and took stances on issues that divided American society. But the comparison falls down in some important ways. Ali was a black man in the 1960s refusing to join the U.S. military during a time of war. James’s stances (such as casting Trump as divisive and saying he would not have attended a White House celebration with the president if his team had won the NBA championship) are not nearly as controversial. I doubt he will ever be cast as unpatriotic in the way that Ali was. James is not even kneeling during the playing of the national anthem, the most controversial political tactic of players today. (More on that in a bit). Also, while I don’t want to downplay the racism of America in 2018, we know that liberal-leaning Americans, white and nonwhite, are open to embracing the leadership and political voice of a charismatic black man. That was not clear in Ali’s era. Trump is unpopular for a president in his second year. And black Americans are, among racial and demographic groups, the bloc most opposed to Trump. This is not like the Dixie Chicks, a white country music group, taking on George W. Bush in his first term, when he was still fairly popular. James has suggested that the president has encouraged people to express racist views, hardly a controversial idea, since the majority of Democrats and nearly half of Americans overall say that Trump is racist. Stephen Curry, the best (or second best, depending on your POV) player on the NBA’s best team has criticized Trump. So have (white) NBA coaches Steve Kerr and Gregg Popovich. It’s not clear if James is leading or following this anti-Trump movement, but at least in the NBA, it’s not unusual for prominent figures to criticize the president. Even Michael Jordan, well-known in his playing days for avoiding political stances, is shedding that apolitical approach now, last fall defending Curry and other Golden State Warriors players after they were criticized by Trump. As FiveThirtyEight explained last year, Colin Kaepernick’s prior performance on the field should have landed him at least a backup quarterback job in the NFL last season. It appears that NFL teams aren’t signing Kaepernick, at least in part, because of his kneeling during the national anthem and the backlash that it caused. But let’s be blunt: Kaepernick is, at best, a fairly average player. James is arguably the best basketball player ever. (Yes, I’m old enough to have watched Jordan in his prime.) I think James could start kneeling during the national anthem and all 30 teams in the NBA would still try to sign him — and I think most teams in the NFL would try to acquire, say, Green Bay quarterback Aaron Rodgers if they could, even if he started kneeling. In other words, James doesn’t face much risk financially by becoming politically active. That’s not true for all athletes. James, like, Oprah Winfrey, is kind of a fantasy presidential candidate, particularly for liberals — someone who in theory has all of the appeal of Barack Obama in 2008. (He could potentially get some white-leaning moderates and conservatives and draw huge enthusiasm among young and black voters.) Will he will run for president in 2020? I’d be surprised if he did, but you never know. But I expect him to continue to attack Trump and to embrace the next Democratic presidential nominee, no matter who that is. James’s political stances say something about him and other athletes of his era, who are less reluctant about interjecting themselves into politics than Jordan and his peers. But I wonder if James’s behavior tells us more about the times we are living in: We have a deeply divisive president who is hated by African-Americans, who are more than two-thirds of the players in pro basketball and pro football.